Looking for older newsletters? Click HERE for Texas Tidbits from Texas Abate Confederation, Inc.
​YARD SIGNS ARE HERE... 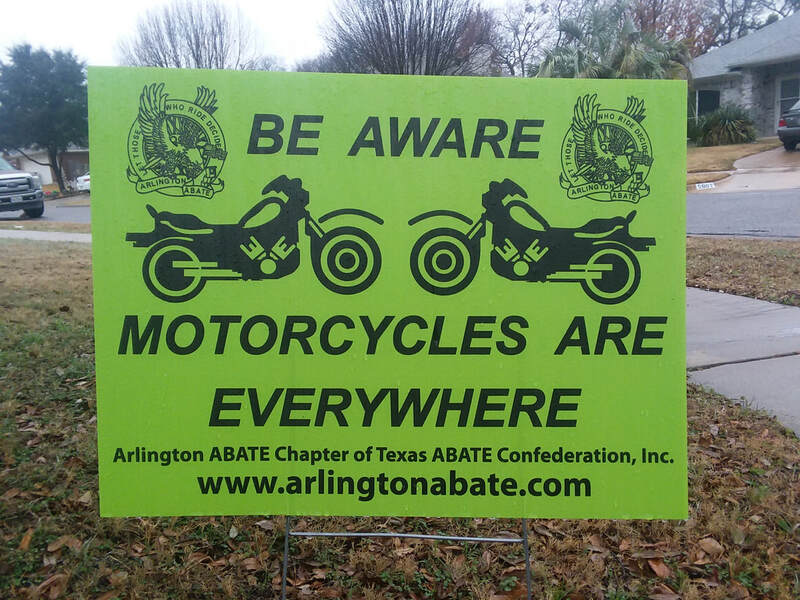 If you would like one of these signs in your yard, please email arlingtonabate@gmail.com to make arrangements for pickup or come to the next chapter meeting. LookLearnLive.org has posted a survey to gather data to learn why motorcyclists ride without proper endorsements. Please follow the link to take this short survey. The survey will be open through May 31, 2019. HEADS UP TEXAS... It is time to take action! (c) It is an exception to the application of Subsection (a) or (b) that at the time the offense was committed, the person required to wear protective headgear was at least 21 years old and had successfully completed a motorcycle operator training and safety course under Chapter 662 or was covered by a health insurance plan providing the person with medical benefits for injuries incurred as a result of an accident while operating or riding on a motorcycle. A peace officer may not arrest a person or issue a citation to a person for a violation of Subsection (a) or (b) if the person required to wear protective headgear is at least 21 years of age and presents evidence sufficient to show that the person required to wear protective headgear has successfully completed a motorcycle operator training and safety course or is covered by a health insurance plan as described by this subsection. (c-1) A peace officer may not stop or detain a person who is the operator of or a passenger on a motorcycle for the sole purpose of determining whether the person has successfully completed the motorcycle operator training and safety course or is covered by a health insurance plan. (c-2) The Texas Department of Insurance shall prescribe a standard proof of health insurance for issuance to persons who are at least 21 years of age and covered by a health insurance plan described by Subsection (c). (i) In this section, “health insurance plan” means an individual, group, blanket, or franchise insurance policy, insurance agreement, evidence of coverage, group hospital services contract, health maintenance organization membership, or employee benefit plan that provides benefits for health care services or for medical or surgical expenses incurred as a result of an accident. This will put a helmet on your head, if it passes! Call your representatives today! Not sure who your rep is or how to reach them?